The manual CMC Power-Lift is totally constructed of 6061 T6 extruded aluminum alloy and fastened with stainless steel fasteners. 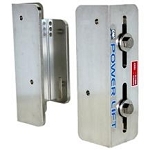 It utilizes an all thread stainless steel screw centrally located for uniform lift, convenience, and positive alignment. The ML-65 can easily be adjusted from the top or bottom on the water! 1 ½” of adjustment at the transom bracket.